The 2018 North Coast CPD Conference schedule has been finalised. Please view the program HERE. The North Coast CPD Conference is to be held on Saturday, 17 February 2018 at the Ramada Hotel, Ballina. Full attendance at the North Coast Conference will attract 6 CPD points and will cover the four strands required for the practising certificate year. NSW barristers, interstate barristers and solicitors are welcome to attend. For more details about the North Coast Conference, or any of the 2017 CPD Conference Series, please click HERE. To register please click HERE. Please note, registrations will only be accepted when accompanied by full payment. 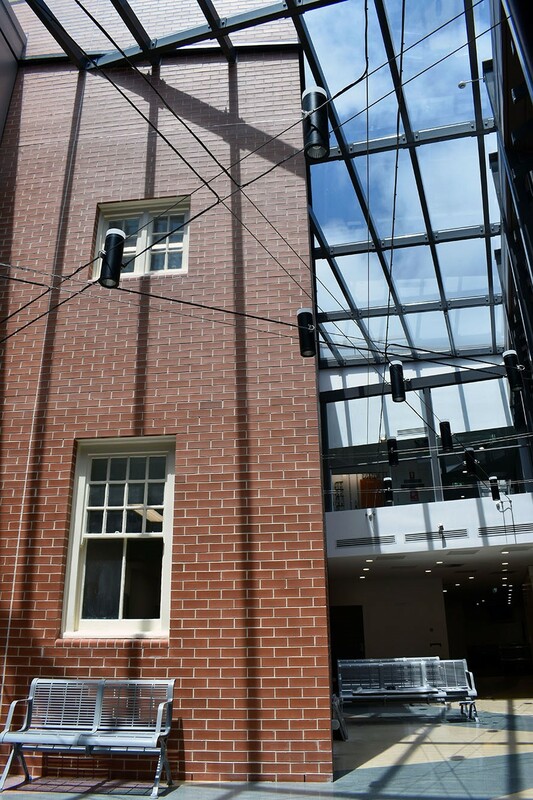 The NSW Bar congratulates the President of the Children’s Court and the Berejiklian Government on the opening of the new facilities which are larger, more technologically advanced and better suited to deal with children. There is no doubt that the redevelopment will increase the Children’s Court’s capacity to conduct specialist hearings involving juvenile offenders. However, the NSW Bar also supports the call by the President of the Children’s Court that there be increased funding to enable the Children’s Court to sit on circuit in country areas so that it’s specialist judicial officers can deal with juvenile offenders in these regions. The Bar Association’s current professional standards scheme, which generally limits liability for damages to $1.5 million, will be recognised in Tasmania on and from 13 February 2018. View the wording of the final amended scheme here. Barristers Classifieds are published each Wednesday. Individual notices will remain here until they are sold. No liability will be accepted by the New South Wales Bar Association for the information contained in the classifieds. A spacious (circa. 5.3 x 3.7 metres) internal room is available for licence on Second Floor Selborne Chambers. Just re-painted, the room has been recently renovated to include a new air conditioning unit, new windows and new roller blinds. The room has floor to ceiling bookcases along one wall, a robe cupboard and storage all along the wall beneath the window. Further bookcases are included. The centrepiece of the room is a leather topped partner’s desk, with leather office chair and conference chairs included. The room is fully networked to Counsels’ Chambers, and is only four floors by elevator to the Bar Library. The 24 floor members practice across a wide range of areas including commercial, corporate, equity, tax, administrative law, medical negligence, personal injury and coronial enquiries. The asking price is $3,000 per month. Please contact the clerk, Sarah Aleksovski (9233 6400; saleksovski@selbornechambers.com.au) for further details. Enquiries will be treated in strict confidence. An opportunity to join Jack Shand Chambers on Level 55 in one of Sydney’s most iconic buildings ‘The MLC Building’, 19-21 Martin Place Sydney. We have possibly the best room on the floor for sale. Over 40 sqm this outside room faces north east and beyond overlooking the Domain and the Royal Botanic Gardens with gun barrel views up the harbour to the heads. The room comes extremely well fitted out with an extensive library. For all enquiries please contact Dennis Wheelahan RFD QC or his Clerk Stephen Upton on 9233-7711. All such enquiries will be dealt with in the strictest confidence. An external room has become available to licence at Chalfont Chambers. The monthly licence fee is $2,500 excl. GST. Chalfont Chambers is located in the Culwulla Chambers building at 9/67 Castlereagh Street, Sydney. If you are interested in inspecting the room, please contact the Clerk, Justine Ferraro on 02 9232 0186 or clerk@chalfont.com.au All enquiries will be dealt with in the strictest of confidence. 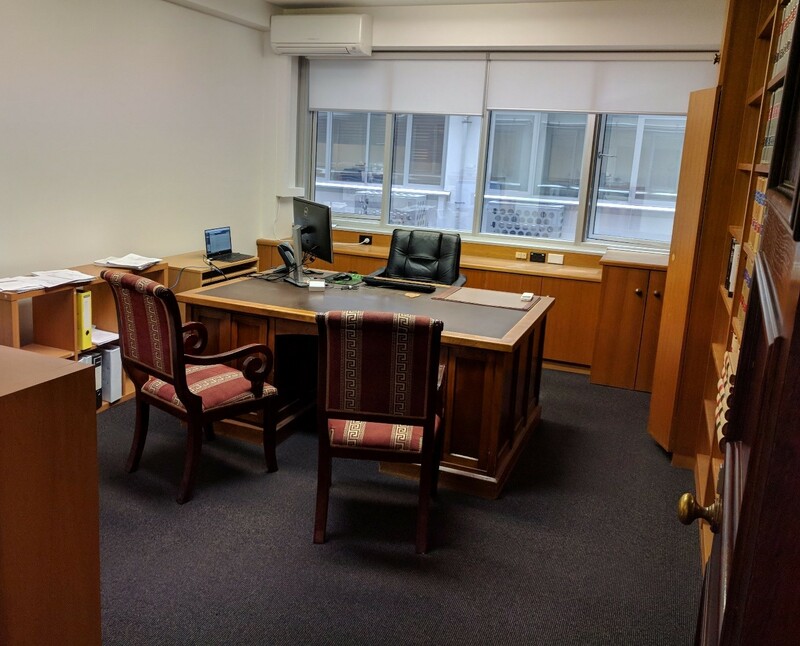 Presently licensed on a short term basis, a larger size room (1 and 1/3 size or 4000 shares in CCL) on the Macquarie Street side of Second Floor Wentworth Chambers is available for purchase. It would most likely suit a silk, aspiring silk or senior junior, with or without a PA, or else a barrister requiring or needing more, but not too much, extra space. The room has extensive “Rosewood” colour shelving and cupboards and a Mitsubishi air-conditioner. 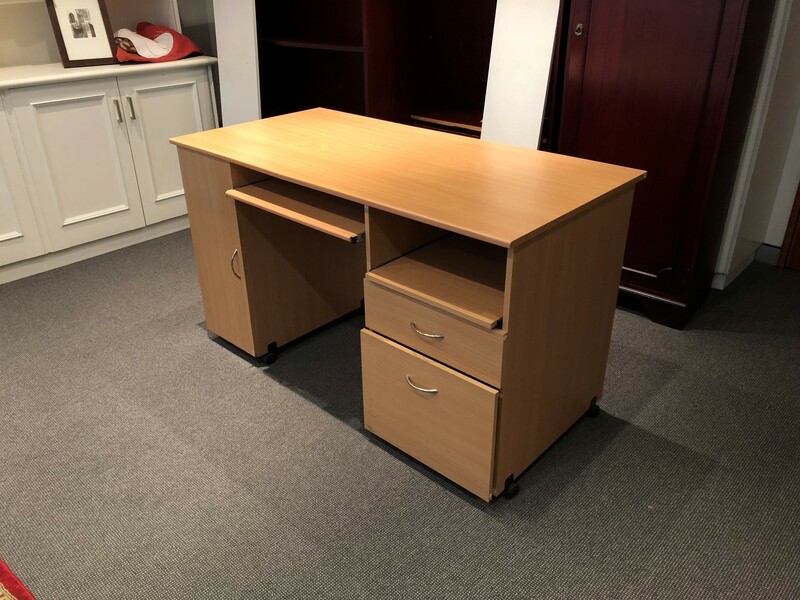 There is also a large leather-topped desk with matching leather office chair, a leather lounge and 2 leather lounge chairs, all in excellent condition, which may be included in the sale. CCL Maintenance Contributions are only $1,552.86 pm incl of GST and SFWC Floor fees are only $2,093.85 pm incl of GST. 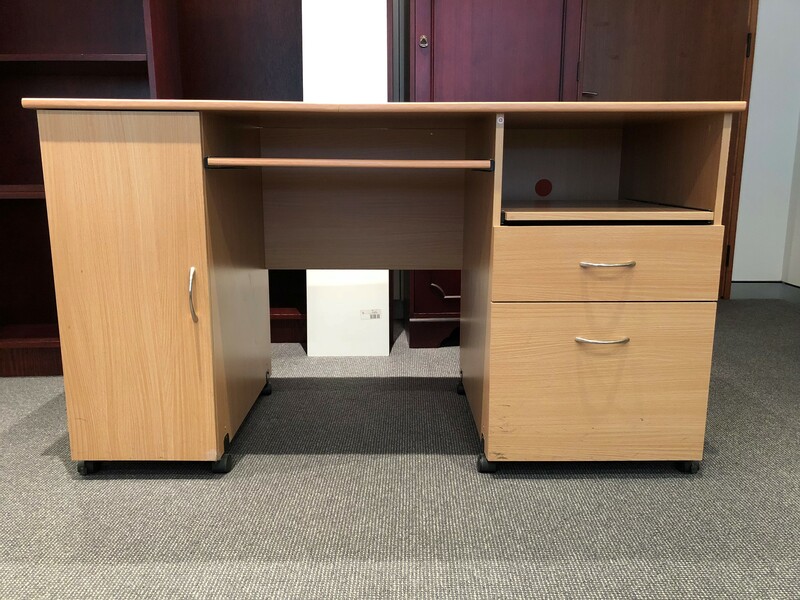 The floor is fully networked to CCL, uses its VOIP telephone system, has a WiFi connection, and has its own website and electronic diary management by the Clerk. Recently, the floor’s common areas underwent a stylish refurbishment. There is also easy access from the floor through Second Floor Selborne Chambers and the Selborne lifts to the Bar Library. The floor currently comprises 2 silks, 17 juniors and 2 readers. Members practise in most jurisdictions and areas of practice. Floor members work together harmoniously. Third Floor Wentworth Chambers currently has a spacious 1 ½ size room for sale (4500 shares in CCL). The internal light well facing room has new carpet and windows, a new air-conditioning unit and extensive shelving. All enquiries regarding sale price or inspection can be directed to the clerk, Kaitlyn Faiella, on 9232 3937 or clerk3@wentworthchambers.com.au All enquiries will be dealt in the strictest confidence. 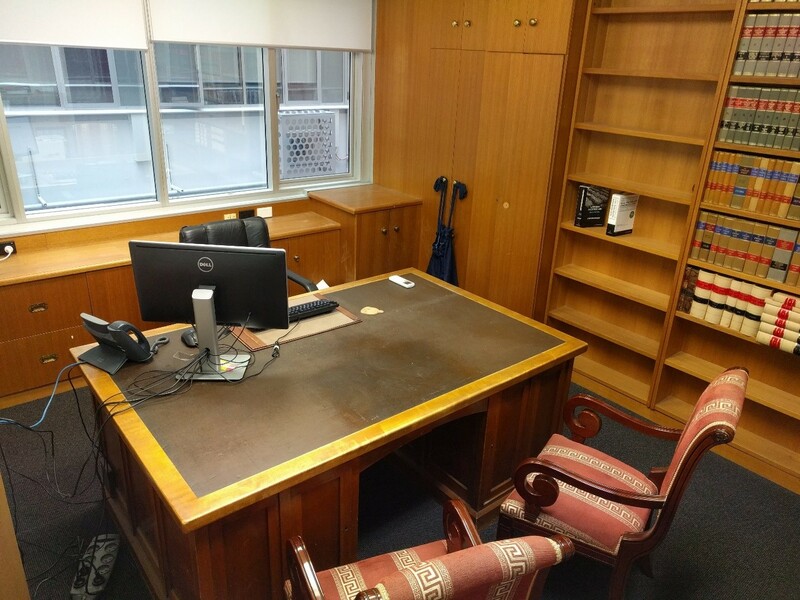 An impressive large external room (18 sq m) with views of historic Macquarie Street is available for purchase at Sixth Floor Windeyer Chambers for $65,000.00 ono. The room has floor to ceiling double-glazed windows and built-in bookcases with fitted desk included. Would suit senior counsel or senior junior. The Counsel’s Chambers maintenance levy is $ 1,273.51 per month (incl. gst), and floor fees are $1,657.50 per month (incl. gst). 3,280 shares in Counsels Chambers Ltd. The floor consists of one senior counsel, 7 senior juniors and 4 juniors with a wide variety of work. 30 years experience | cost effective | Done right on every time. Timely, efficient, national service based in WA. On 16 March 2018, the Bar Association will host an all-day CPD at the Federal Court, titled "The Sword of Damocles". The CPD will examine the unique world of regulatory litigation and in particular, decisions made by regulators to pursue matters on a civil, criminal or administrative basis, the different regimes engaged and a considerate of the different outcomes that follow from those decisions. Speakers include: The Honourable Justice Payne of the Court of Appeal, Tim Game SC, Neil Williams SC, Elizabeth Cheeseman SC and Reay McGuinness, solicitor, at Webb Henderson. Afternoon panel will include: The Chief Justice of the Federal Court, The Hon J L B Allsop AO; the Commonwealth Director of Public Prosecutions, Sarah McNaughton SC; Wendy Peter of the ACCC; Chris Savundra of ASIC and from the Sydney Bar: Bret Walker SC, Tim Game SC and Kristina Stern SC. The CPD commences at 9.30am and concludes at 3.30pm in Courtroom 1, Level 21, Federal Court, Law Courts Building, Queens Square, Sydney, NSW 2000. The CPD will include morning tea and a light lunch. A nominal fee of $45 will be charged per attendee. REGISTER YOUR ATTENDANCE HERE. REGISTRATIONS ARE LIMITED TO 200 ATTENDEES. Places are ‘first in, best dressed.’ To register attendees must complete the online registration form. Please note, registrations will only be accepted and guaranteed when accompanied by full payment. Presented by David Pittaway QC of Hailsham Chambers, London, England. Further details to follow. A CPD seminar titled "The Structure and Themes of the ICAC" was due to be held in the Bar Association Common Room tonight, Tuesday 30 January 2018. This seminar has now been rescheduled for Monday 9 April 2018. Further details will be advertised in In Brief nearer the event. Registrations are OPEN for the 2018 Personal Injury and Common Law Conference, which will be held at the Hilton Sydney on Saturday 3 March. Jennifer Stuckey-Clarke of Sixth Floor Windeyer Chambers has been elected as Vice-President, Western Pacific of the International Academy of Estate and Trust Law. On 16 March 2018, the Bar Association will host an all-day CPD at the Federal Court, titled "The Sword of Damocles". The CPD will examine the unique world of regulatory litigation and in particular, decisions made by regulators to pursue matters on a civil, criminal or administrative basis, the different regimes engaged and a considerate of the different outcomes that follow from those decisions. Speakers include: The Honourable Justice Payne of the Court of Appeal, Tim Game SC, Neil Williams SC, Elizabeth Cheeseman SC and Reay McGuinness, solicitor, at Webb Henderson. Afternoon panel will include: The Chief Justice of the Federal Court, The Hon J L B Allsop AO; the Commonwealth Director of Public Prosecutions, Sarah McNaughton SC; Wendy Peter of the ACCC; Chris Savundra of ASIC and from the Sydney Bar: Bret Walker SC, Tim Game SC and Kristina Stern SC. The CPD commences at 9.30am and concludes at 3.30pm in Courtroom 1, Level 21, Federal Court, Law Courts Building, Queens Square, Sydney, NSW 2000. The CPD will include morning tea and a light lunch. A nominal fee of $45 will be charged per attendee. Topics will include: Criminal Law and Human Rights; Reforms to the Criminal Justice System; The Impact of Bugmy and Bunda on Sentencing Aboriginal and Other Offenders; the Koori Court proposal; Advocacy skills when dealing with vulnerable witnesses; tendency evidence and developments in joint criminal enterprise. The registration fee of $470 includes lunch. An early-bird fee of $420 is available until Friday, 16 February 2018. Online registration is available here. Members are reminded to accrue 10 points worth of continuing professional development (CPD) activities each year. In addition to completing sufficient CPD activities between 1 April 2017 and 31 March 2018, you are required to maintain a record and retain in for three years in accordance with rule 12 of the Legal Profession Uniform Continuing Professional Development (Barristers) Rules 2015. A newly updated CPD Record Form makes it easier to record, amend and save your CPD activity. The new form is available on the NSW Bar website and attached here for your convenience. Chris Ronalds SC was made an officer of the General Division of the Order of Australia (AO) in Friday's Australia Day Honours list, for "distinguished service to the law and the legal profession, particularly in supporting, mentoring and developing the careers of Indigenous lawyers and law students". President Arthur Moses SC congratulated her, saying: "Chris has been tireless in her efforts over the last fifteen years in assisting Indigenous law students and lawyers and she has displayed great leadership in her voluntary roles as chair of the Bar Association’s Indigenous Barristers’ Working Party, principal Trustee of the Indigenous Barristers’ Trust (also known as the Mum Shirl Fund), and as a member of the Law Council of Australia’s Indigenous Legal Issues Committee. She has been instrumental in initiating and progressing numerous activities on behalf of the Association, which are aimed specifically at assisting Indigenous law students and lawyers." Ms Ronalds was awarded a Member of the Order of Australia (AM) in 1994 for "service to women, particularly in the area of anti-discrimination and affirmative action". Other members of the New South Wales Bar Association were recognised. Geoffrey Robertson QC was made an officer of the Order of Australia (AO) for "distinguished service to the law and the legal profession as an international human rights lawyer and advocate for global civil liberties, and to legal education as an academic and publisher". The Hon Richard Edmonds SC was made a member of the Order of Australia (AM) for significant service to the judiciary, particularly through the Federal Court of Australia, to revenue and taxation law, and to the legal profession. Garth Blake SC was made a member of the Order of Australia (AM) for significant service to the Anglican Church of Australia, particularly to child protection policy and professional standards, and to the law. Gina O’Rourke SC will be sworn-in as a judge of the District Court at ceremonial sitting tomorrow, 30 January 2018 at 9.00am on Level 21 of the John Maddison Tower. Michael McHugh SC will speak on behalf of the New South Wales Bar. Barristers should wear wigs and gowns. Senior counsel should wear full-bottomed wigs. a) reviewing policies and procedures for the Bar Council and NSW Bar Association to ensure First Nations and First Nations peoples’ perspective are considered where relevant; b) advocating for the rights of First Nations and First Nations people on systemic issues of policy such as Indigenous incarceration, discrimination and the impact of domestic violence on First Nations communities. To provide advice to Bar Council on matters relating to First Nations affairs as required. The new Committee will be chaired by Tony McAvoy SC. A sub-group of this Committee will be chaired by Chris Ronalds SC and will continue the extensive work of the Indigenous Barristers Strategy Working Party. 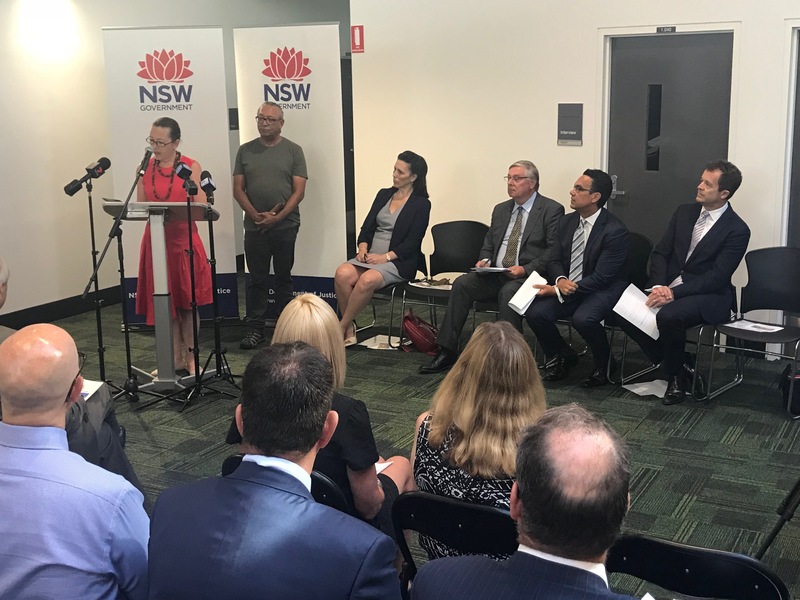 The existing New South Wales Joint Working Party on Indigenous Incarceration will also operate as a sub-committee of the First Nations Committee. I thank Chris Ronalds SC for the extensive work she has undertaken as Chair of the Indigenous Barristers Strategy Working Party as well as Phil Boulton SC and Dr Sarah Pritchard SC for their work as co-Chairs of the Joint Working Party on Indigenous Incarceration. Members will be kept informed of developments regarding the work of the Committee. The Office of the Director of Public Prosecutions (NSW) invites barristers to apply to be appointed to the Private Briefing Panel. The Panel is expected to have a minimum 4 year life span which may be extended as required. An information sheet, which provides greater detail about the Panel can be downloaded here. Further applications will be taken after the close date. However, these applications will only be reviewed in due course. For further information, please email panel@odpp.nsw.gov.au. His Honour Acting Judge Raymond McLoughlin SC passed away yesterday. A private funeral service will be held by the family, with a celebration of his life to follow. Members will be advised of the details as soon as they are known. The Australian Bar Association draws upon the experience and knowledge from its members to effectively represent the profession and advance public debate on law reform and legal policy issues. The ABA's committees are comprised of members from the Association's constituent bodies. The ABA annually reviews the need for the committees, the role of those committees and their membership.ABA members who wish to be considered for appointment to a committee on the attached list should complete the form showing the committees for which they wish to be considered. Members should restrict their choice of committees to no more than two. Existing members of committees who wish to continue on a particular committee should also complete the form. Expressions of interest will close at 5pm on Tuesday, 30 January 2018. The Supreme Court will hold a ceremonial sitting on Thursday, 8 February 2018 at 9.15am in the Banco Court to mark the retirement of the Hon Justice Peter McClellan AM. Tim Game SC will speak on behalf of the New South Wales Bar. Barristers should wear wigs and gowns. Senior counsel should wear full-bottomed wigs. President Arthur Moses SC has welcomed the announcement by the NSW attorney general, the Hon. Mark Speakman SC of three new magistrates: Peter Thompson, Stuart Devine and Daniel Covington. 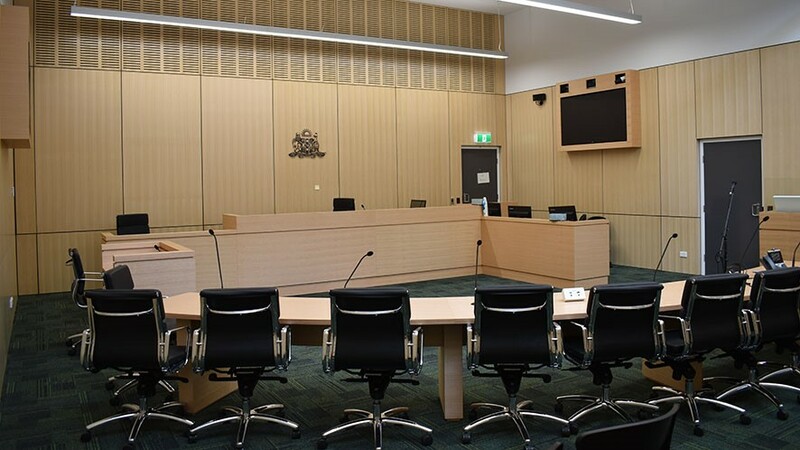 "These are timely appointments of three experienced practitioners and will greatly assist the Local Court to carry out its heavy workload as the busiest court in NSW", said Mr Moses.